Gérard Perse believes this is the greatest Pavie he’s made to date, although certainly I would argue that list includes the 2000, as well as the 2009 and 2010, among his superstars. This wine, which I had both in the 2005 horizontal report in the Wine Advocate, and at a mini-vertical with Perse at the restaurant Maison Boulud in Montreal, looks to be a 75- to 100-year wine. Dense, opaque purple to the rim, with a gorgeously promising nose of blackberries, cassis, graphite and cedar wood just beginning to emerge, it tastes more like a three-year-old than wine that is already a decade old. This beauty is intense and full-bodied, with magnificent concentration, a majestic mouthfeel and a total seamless integration of tannin, wood, alcohol, etc. Beautifully rich, full and multidimensional, this is a tour de force in winemaking and certainly one of the top dozen or so 2005 Bordeaux. Forget it for another 3-5 years and drink it over the following 50-100 years! 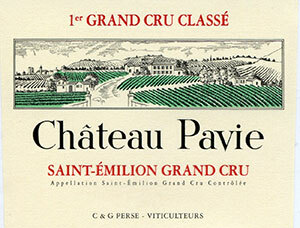 The Château Pavie 2005 has a gorgeous bouquet, very pure and refined with intense blackberry, blueberry, baking powder, violet and mineral-scented bouquet that is utterly entrancing. The palate is full-bodied with lavish ripe black cherries, blueberry and cassis fruit that lacquer the mouth. There is amazing volume and intensity here, a voluminous Pavie and yet it does not stint on precision or elegance on the finish. This is a sumptuous, ravishing, seamless wine that is irresistible and unlike Pavie-Decesse, it is just beautifully proportioned, the terroir starting to seep through as the winemaking recedes. One of the finest wines on the Right Bank.